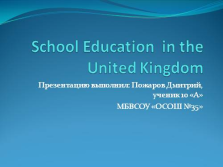 At what age do children start school in the United Kingdom? 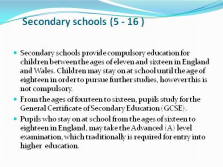 The school age in England and Wales is from 5 years to 16 years. 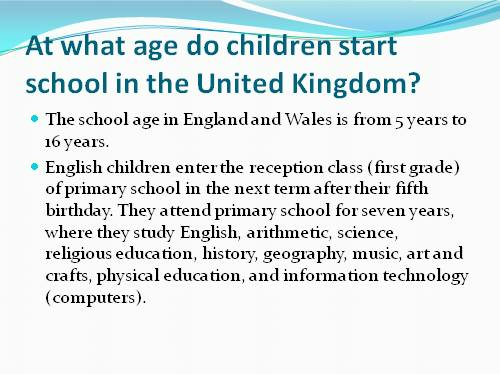 English children enter the reception class (first grade) of primary school in the next term after their fifth birthday. 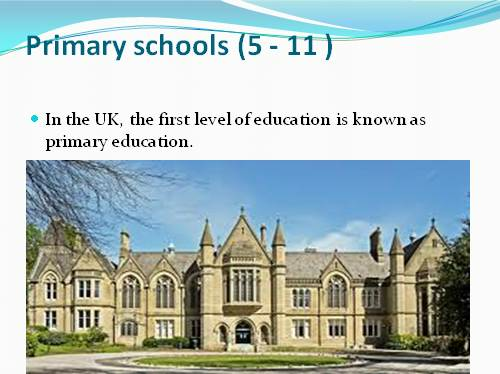 They attend primary school for seven years, where they study English, arithmetic, science, religious education, history, geography, music, art and crafts, physical education, and information technology (computers). 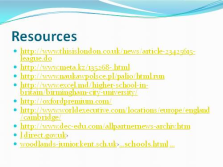 There are schools run by the Government. 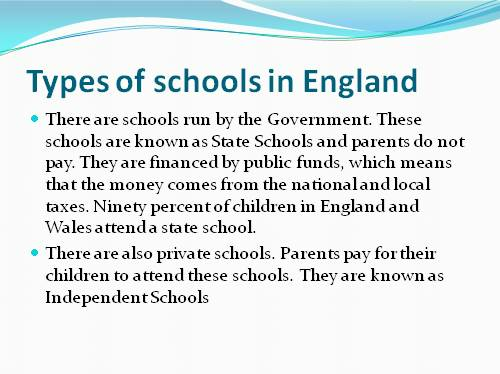 These schools are known as State Schools and parents do not pay. 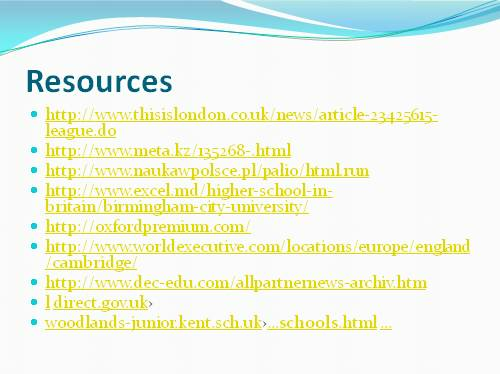 They are financed by public funds, which means that the money comes from the national and local taxes. 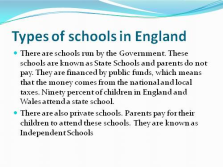 Ninety percent of children in England and Wales attend a state school. 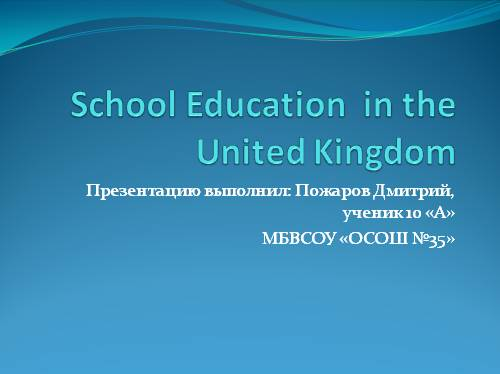 In the UK, the first level of education is known as primary education. 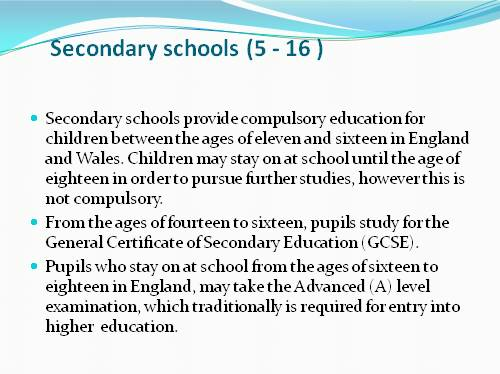 Secondary schools provide compulsory education for children between the ages of eleven and sixteen in England and Wales. Children may stay on at school until the age of eighteen in order to pursue further studies, however this is not compulsory. 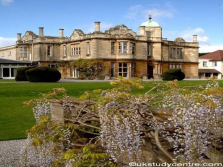 From the ages of fourteen to sixteen, pupils study for the General Certificate of Secondary Education (GCSE). 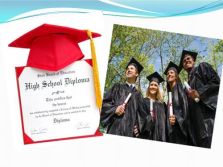 Pupils who stay on at school from the ages of sixteen to eighteen in England, may take the Advanced (A) level examination, which traditionally is required for entry into higher education. 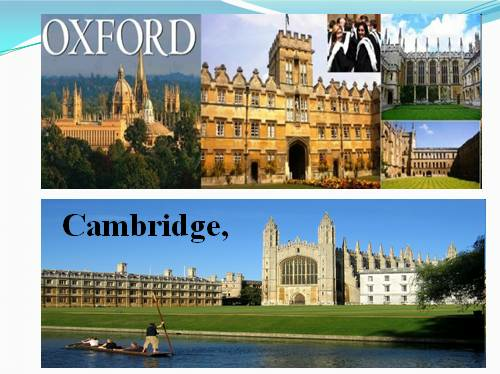 English schools have three terms (semesters), separated by vacations. 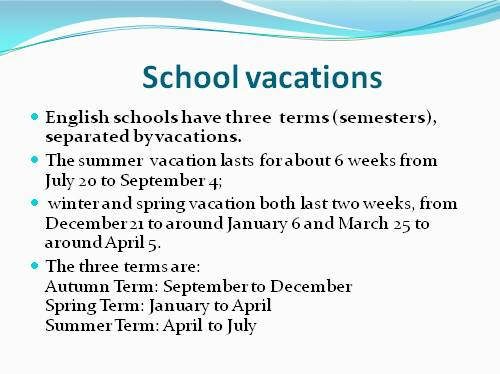 winter and spring vacation both last two weeks, from December 21 to around January 6 and March 25 to around April 5. 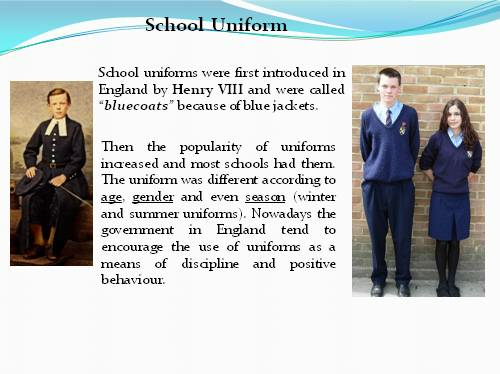 School uniforms were first introduced in England by Henry VIII and were called “bluecoats” because of blue jackets. 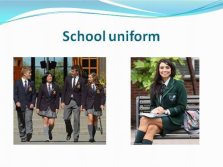 Then the popularity of uniforms increased and most schools had them. The uniform was different according to age, gender and even season (winter and summer uniforms). 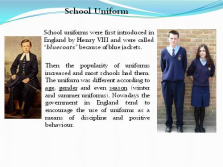 Nowadays the government in England tend to encourage the use of uniforms as a means of discipline and positive behaviour. 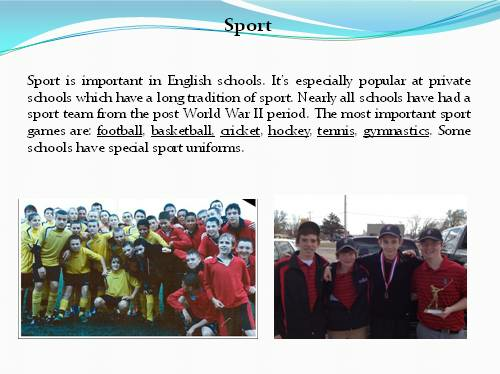 Sport is important in English schools. 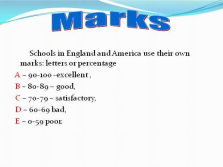 It’s especially popular at private schools which have a long tradition of sport. Nearly all schools have had a sport team from the post World War II period. 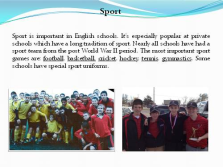 The most important sport games are: football, basketball, cricket, hockey, tennis, gymnastics. Some schools have special sport uniforms. 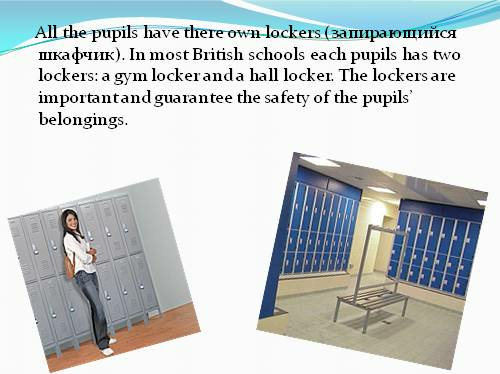 All the pupils have there own lockers (запирающийся шкафчик). In most British schools each pupils has two lockers: a gym locker and a hall locker. The lockers are important and guarantee the safety of the pupils’ belongings. 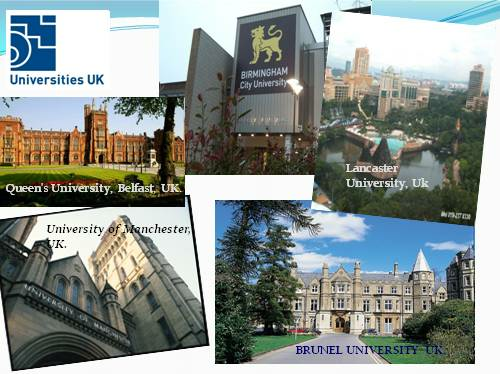 There are also about 500 private schools in Great Britain. 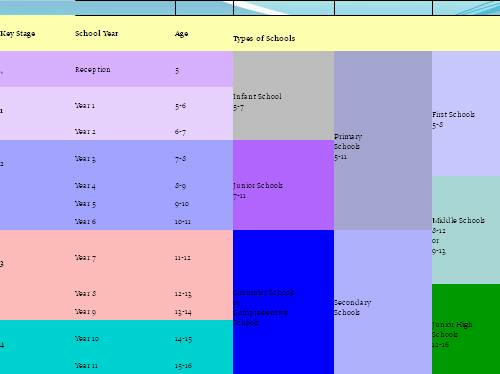 Most of these schools are boarding ones, where children live as well as study. 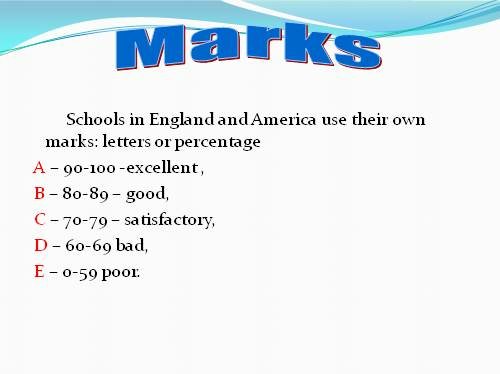 Education in such schools is very expensive, that’s why only 5 per cent of schoolchildren attend them. 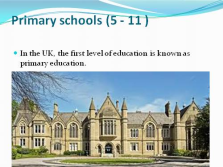 Private schools are also called preparatory (for children up to 13 years old) and public schools (for pupils from 13 to 18 years old). 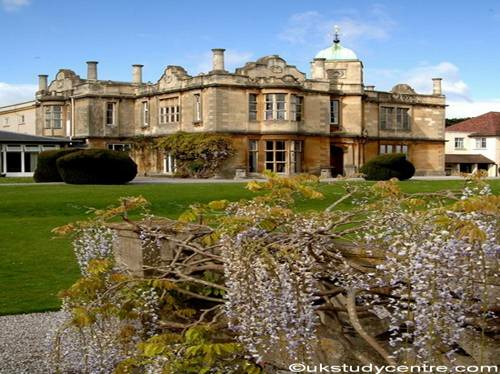 Any pupil can enter the best university of the country after leaving this school. The most famous British public schools are Eton, Harrow and Winchester. 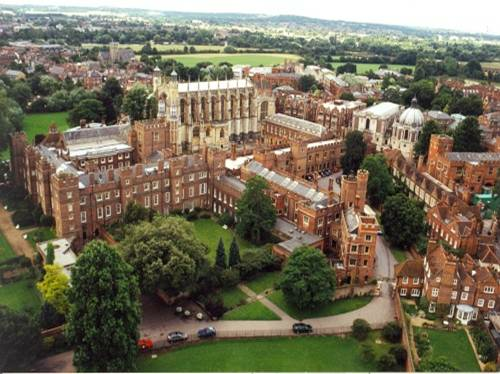 Eton College, a full name is The King’s College of Our Lady of Eton beside Windsor) — a public college for boys. 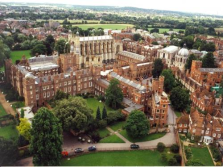 This college was founded by Henry VI in 1440. 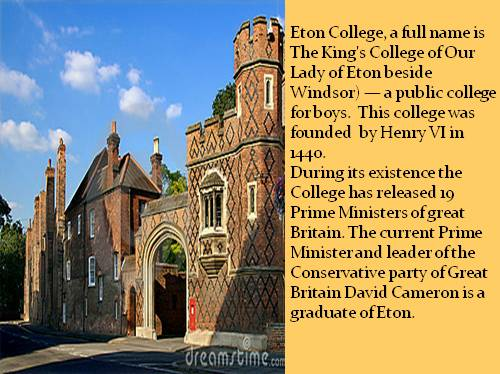 During its existence the College has released 19 Prime Ministers of great Britain. 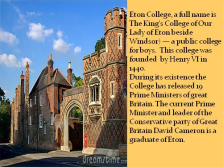 The current Prime Minister and leader of the Conservative party of Great Britain David Cameron is a graduate of Eton. 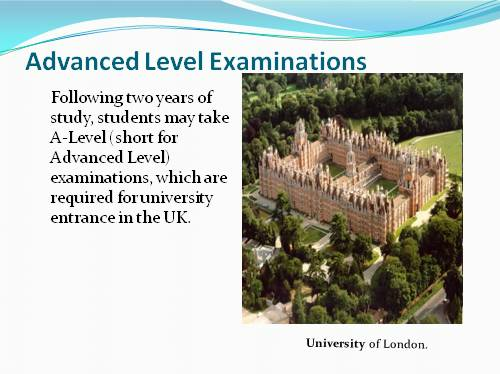 Following two years of study, students may take A-Level (short for Advanced Level) examinations, which are required for university entrance in the UK.